We love Mexican food, and we like making it at home not just going out to eat it at the restaurant. 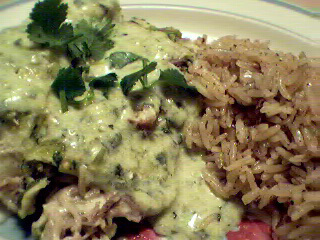 While trying to figure out what to do with some country style pork ribs, we thought we’d try using it in tortilla pie. We just had tacos with Jade’s special bean dip not too long ago, so we didn’t want to have the same thing again. We still had some tortillas left though, so we thought this would be a great way to use them up. This recipe is based on the Tortilla Pie with Chorizo recipe on Mexican – healthy ways with a favorite cuisine by Jane Milton. We didn’t have chorizos or ground pork as called for in the recipe, so we improvised a bit. Here is our version. Simmer everything over medium heat until the pork meat is tender and very little liquid is left. About 1 to 1 1/2 hour. Drain meat from the sauce, cool and shred. In a glass dish or oven safe dish, start layering the meat, cheese, cream, and tortillas until you fill the dish or run out of ingredients. This should make about 3 to 4 layers. Bake in a 400 degree oven until bubbly. Remove from the oven and during plating, top the pie with the tomatilla sauce below. Process all the ingredients, except for the sour cream, until smooth. Transfer the mixture in a small saucepan. Heat over medium heat until it comes to a boil then lower the heat and simmer for 5 minutes. Stir in the sour cream into the sauce and adjust the taste with salt and pepper as needed. Pour this sauce over the baked tortilla pie before serving and sprinkle with more chopped cilantro. I hated to throw away the cooking juices from the pork; so in the same pot, I heated the oil and a bit of the sauce left in the pan, added three cups of raw rice and pan fried it for a minute. Added a 3 cups of water to deglaze and cook the rice. Cover until all the liquid has been absorbed by the rice and it is cooked through. Mix before serving. Also, after the pie came out of the oven, it was a bit drier than I would have liked. I think next time I may do away with the cream (too much added calories, not much added in terms of flavor – all I coult think of while eating is how much cream is absorbed in the dish! ), and use the tomatilla sauce to moisten the layers instead of waiting to pour it on top. Otherwise, this dish is very flavorful. I agree, Templar. It is a treat when you can make it at home. Plus, me with three kids, home is the best place to feed them 🙂 Thanks for visiting! wow this was fab.. It is soo hard to find good mexican food in Canada. It is such a treat when I can make it at home. Hi Lani! I’m glad to have helped you out. The dip is also good with ground beef if you like to have meat. I’m not sure if Jade put guacamole on hers, but you can add it to your layers along with some black beans and it gets really pretty and yummy! 🙂 Tomato salsa is really easy to make, just blend together tomato, onion, peppers, and cilantro in a blender with a bit of salt and/or garlic. Blend according to your taste, whether you like your salsa smooth or chunky. We’ve been to a wedding reception and we had this tortilla chips with tomato salsa dip. I love it so much but I don’t know how to make the sauce. Then I read it here in your blog. Yipeee, thanks JMom. You’re tortilla pie looks really delicious but your rice caught me in the eye- recipe please! Thanks for sharing. Ingat ha!